Dazzler has come back from the dead after being killed by a Jean Grey from another dimension (don't ask, this is comics after all) and is having a chat with Dr. Reyes about life. 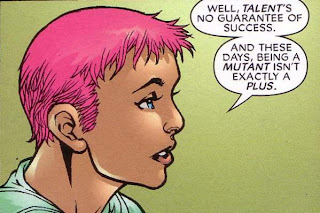 Dr Reyes encourages Dazzler regarding her singing abilities and career and Dazzler makes a very wise statement about talents. This got me thinking about the many talents we're all blessed with which few use to their full potential. I believe that everybody is exceptional is certain abilities but not everybody takes the time to fully master and utilise those skills to make a success of them. 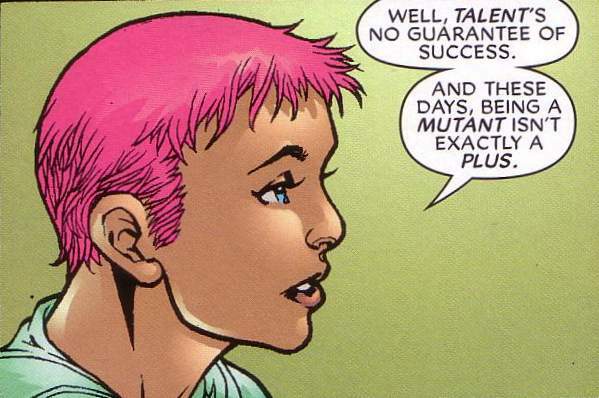 You don't need to be a mutant who can fly or shoot beams out of their eyes to make a success of what you've already been given either genetically or through development over time. I picked up this New Excalibur trade paperback in the bargain bin but I loved the stories. It's been many years since I've seen these characters handled this well and I highly recommend this collection to any avid comicbook (and especially to Excalibur) fans! References: Taken from New Excalibur: Defenders of the Realm (ISBN: 0-7851-1835-7) by Chris Claremont (writer), and Michael Ryan and Steven Cummings (artists). Published by Marvel Comics. It can always get worse. Both Iron Fists (Danny and his grandfather) prepare to stand off against an army of assailants. The modern Iron Fist, Danny, comments how things "can't get worse" but his grandfather, the elder Iron Fist, corrects him before they are hit by a ton of nastiness. I loved this Iron Fist revival storyline which really brought character to Danny and helped elevate him from the stereotypical "kung fu" character who was generally written purely for combat scenes. 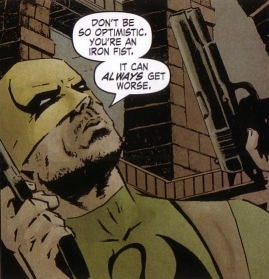 What I love about this quote is how the more mature Iron Fist knows that they've been equipped with a great gift for a reason. They're meant to go up against insurmountable odds and come out despite those odds and past experience teaches you that things generally get worse when you least expect them to. Especially in the superhero business! References: Taken from The Immortal Iron Fist: The Last Iron Fist Story HC (ISBN: 0 7851 2854 9) by Ed Brubaker and Matt Fraction (writers), and David Aja (artist). Published by Marvel Comics. Maybe we'll fall -- but we don't fold. Songbird: "Sorry, Immortus. But we're the Avengers." Giant-Man: "We've never been very good at surrendering. Maybe we'll fall --"
Captain Marvel: " -- but we don't fold." The time-displaced Avengers are facing off against Immortus and the Time Keepers who seek to destory Rick Jones and his influence on the future timelines. Immortus offers them a chance to give up and allow the Time Keepers to fulfill their mission ... but the Avengers don't roll over that easily! This 12 issue maxi-series was ground breaking at the time in terms of how it tackled using Avengers characters across different timelines as part of the same team and made for a fun, roller-coaster ride! While it takes 3 Avengers to say this bold quote its testament to the teamwork and comraderie they share as the premier superteam of the Marvel universe. While the Avengers have been diluted over the years into multiple teams they serve as a good example of what it takes to work as a team because they motivate and encourage each other and are tackle any task no matter how great or small because of how well they work as a unit. References: Taken from Avengers Forever (ISBN: 978-0-7851-3796-2) by Kurt Busiek (writer) and Carlos Pacheco (artist). Published by Marvel Comics.